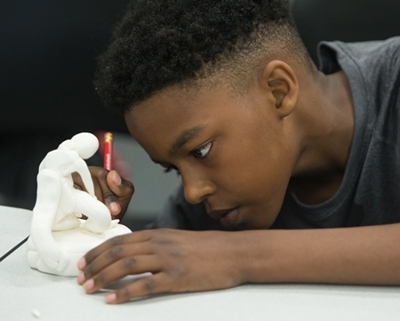 Students from across Madison and St. Clair Counties spent June 19-23 at Southern Illinois University Edwardsville shooting hoops and practicing math and physics skills during the We Got Game: NBA Math Hoops camp. The camp was offered through the SIUE School of Education, Health and Human Behavior (SEHHB) and the Office of Educational Outreach. During the interactive camp, 14 students, grades 5-8, engaged in learning both on and off the basketball court. The NBA Math Hoops game works on addition, subtraction, multiplication and division. Students spent their mornings considering the stats of NBA and WNBA players, and then built their own stats on the court in the afternoons. Crafts, like creating a clay trophy, rounded out the hands-on experience. “When you offer students something that’s fun, but involves learning, they don’t even realize that they’re practicing their math skills,” said Kayla Carlisle, lead teacher of the camp. Carlisle earned a bachelor’s in elementary education from SIUE in 2017 and is a certified teacher in St. Louis Public Schools. During a standard academic year, teachers have weeks to form a community among their students, added Barbara O’Donnell, PhD, professor in the Department of Teaching and Learning in the SEHHB. Still, in the camp’s short timeframe, participants from a variety of area cities, quickly created friendships. 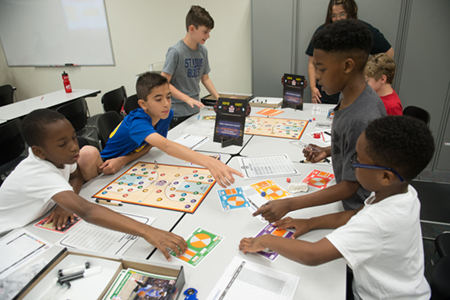 Photo: Participants in SIUE’s We Got Game: NBA Math Hoops camp work together to enhance their math skills through interactive learning. A student works meticulously to create his own trophy.